We’ve had a new arrival this week, Ronaldo. 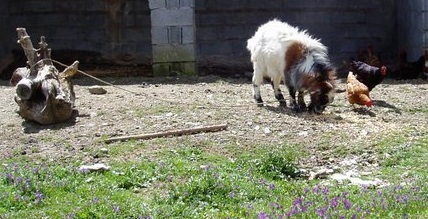 He’s unbelievably stinky, and he’s our new Billy goat. When a friend mentioned that she knew of a male goat seeking a new home, having been abandoned once and now unwanted, I grabbed the opportunity. Until now we’ve been borrowing the services of a Billy from goat keeping neighbours, but as our two youngest goats have failed to get pregnant so far it’s been a lot of negotiating for nothing. Having a Billy of our own means we’ll have his services available when we want them. He’s only a little chap and rather placid, but this doesn’t seem to be affecting his enthusiasm for the job one jot. Our male dogs have taken exception to his presence, and have taken to running around him in circles barking their daft heads off. I guess that in their little doggie brains this is how they prove their virility. Ronaldo is unimpressed and ignores them, preferring to stand with his upper lip curled and tongue half out letching at the ladies. He’s currently lodging at night with Little Horny, although I hate to say that she’s really not living up to her name so far and has been avoiding his attentions by climbing inside our unused rabbit hutch. Forget romantic candles and soft music, I’ve jammed a crate in the rabbit hutch in the hope that it makes her more receptive! Ronaldo arrived with a nasty wound on his neck caused by a rope which had become too tight over time and had become embedded in the skin. I’m sure his previous owners, where he was simply lodging, had no idea but he had apparently seen a vet recently and how the vet could have missed it I’ve no idea. The smell alone was enough to make me gag when I treated it. I spent a very unpleasant ten minutes trimming his hair back so I could see it properly, but I’m pleased to report that a good wash and that wonderful bright blue antiseptic spray is working wonders and the flow of oozing pus seems to have slowed down. If anyone had suggested to me ten years ago that I’d be spending my days providing veterinary services to smelly goats clamped between my knees I’d have thought them mad. Elsewhere in the animal house I’ve had to cull one of the chickens after she developed an impacted crop. Searching around the internet this morning I’ve found instructions for operating on an impacted crop at home using nothing more advanced than a scalpel, alcohol and superglue 😮 If you consider that superglue was originally developed to treat injuries on the battlefield for the US Army it’s not such a silly idea. Let’s hope it’s not something I ever need to test out. The other chickens are suffering with something which I’m sure is depluming mite. It’s a parasite which lives at the base of the feather shaft, causing them to break off and bald patches to appear. Unfortunately I put the odd bald spots down to feather pecking at first so it took me a while to realise I needed to look elsewhere for an explanation. If any of our Portuguese followers could recommend a treatment I’ll be able to buy locally I’d be very grateful. The staff in the local pharmacy think I’m stark raving bonkers already so I can imagine a combination of my fractured Portuguese and miming feathers falling out leaving them reaching for the straight jacket. Our departed chicken has been replaced with a new one already. A friend lost the rest of his flock, so she has come to join us to save her being lonesome. So far she’s settling in well. I don’t think I want to follow that link to find out what “impacted crop” means … On the other hand, the new goat looks lovely, very fluffy! Hope Little Horny lets him have his wicked way with her soon!